Greek Baptism guitar lampada and chrisomes (ladopana) set for baby boy Orthodox Christening. This cute baptismal set is made with neutral color fabric and dark blue gauze fabric. 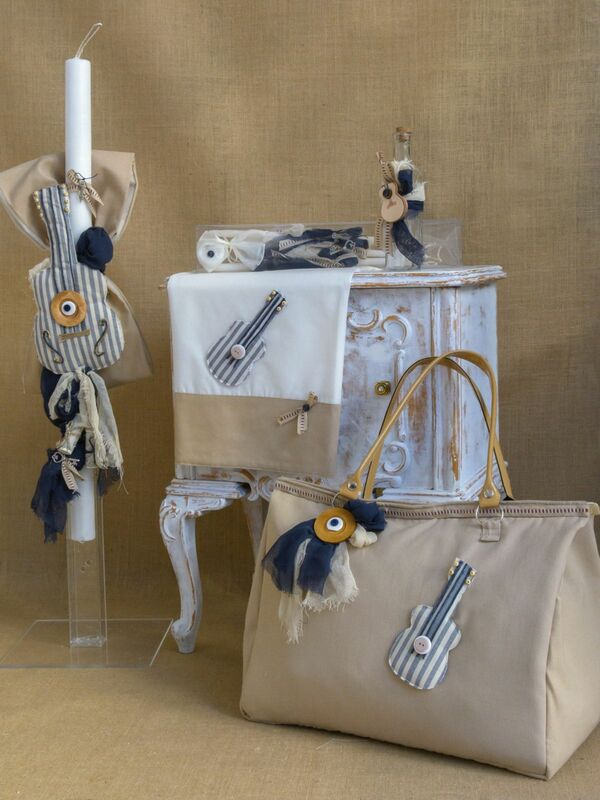 The lampada, ladopana and large bag decorated with striped fabric guitars. On the lampada is hanging this nice striped guitar tied with blue and white gauze fabric, decorated with wooden evil eye. Large bag also adorned with wooden evil eye, and guitar.Oil bottle decorated with wooden guitar, and the three candles decorated with metal quitar, metal treble clef, and metal old fashion key. https://www.preciousandpretty.com/2017/03/guitar-christening-lampada-and-chrisomes-set-CSB33.html Greek Wedding Favors|Orthodox Crowns|Stefana|Baptism Invitations Guitar Christening lampada and chrisomes set CSB33 Guitar Christening lampada and chrisomes set Product #: Greek Wedding Favors|Orthodox Crowns|Stefana|Baptism Invitations_4095122132531550485 5 stars out of 5 reviews.